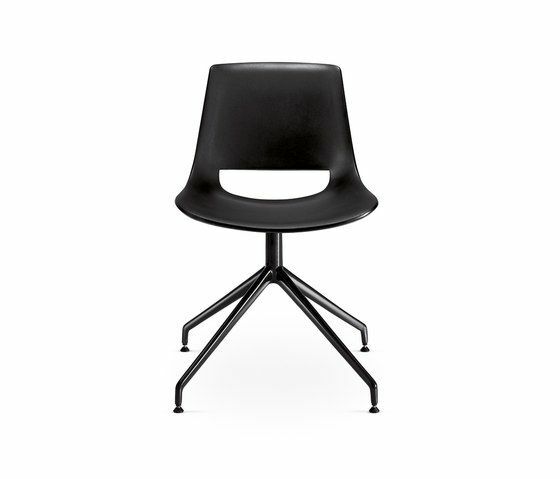 Chair on shiny or lacquered aluminium swivelling base. The shell is in polyethylene, available in a wide range of colours. The Palm seating system fits beautifully into residential settings, studios, offices and restaurants thanks to its versatile design: informal and invigorating, yet robust and functional. It offers a choice of models and colors, depending on setting and use. All with a great attention to quality and ergonomics. The shell of the Palm seating range is available in polyethylene or covered in leather, faux leather, fabric or the customer’s own fabric. Palm’s versatility is also evident in the choice of bases: 4-leg, also with armrests, sled, trestle with swivel in polished or painted aluminum, with or without castors; and the 5-star version in aluminum with seat repositioning mechanism or 5-star on castors with gas lift. Greenguard GECA certification (Good Environmental Choice Australia) for the models with no upholstered polyethylene shell and base in painted steel or aluminum.